There are some things that just go together. For most children, summertime and ice cream make a delightful pair! We will devote the next several posts to an Ice Cream Theme for Preschool and Kindergarten. The ice cream activities are geared toward kids ages 2-7, but can be easily be adapted for children of differing skill levels. We hope you and your children enjoy them together! Introduction – Take a poll of your children and ask how many of them like ice cream. (*Please note that some children may have allergies so flavored ices/non-dairy products can be included in the poll for those children.) Make a simple bar graph of the flavors of ice cream that the children like the best. Read the book, Should I Share My Ice Cream? by Mo Willems. It is a funny, wonderful book that the children can relate to! 1). 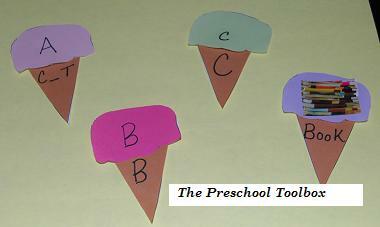 LETTER RECOGNITION -Laminate the cones and scoops and cut them out. Use a dry erase marker to label a cone with a letter and a scoop with the corresponding letter. Have the children match the letters to make the ice cream cone. For older students, have them match uppercase to lowercase letters. 2). CVC WORDS – Label a cone with two letters – for ex: C __ T. Label a scoop with the letter A. The children must find the scoop with the letter that will form the word. The cones and scoops can be used to make entire word families, too! 3). SIGHT WORDS – Label the cones with sight words and the scoops with the corresponding words. Place all the cones and scoops face down on the table or the floor. Have the children play a matching game “memory” style to find the words that match in order to build their ice cream cone. 4). WORD IDENTIFICATION – label a cone with a WORD and a scoop with the PICTURE of the word. Have the children match the WORD to the PICTURE in order to build their ice cream cones. ICE CREAM MATH – Check out this post for another free ice cream cone template and basic instructions for math and pre-math activities for young kids! 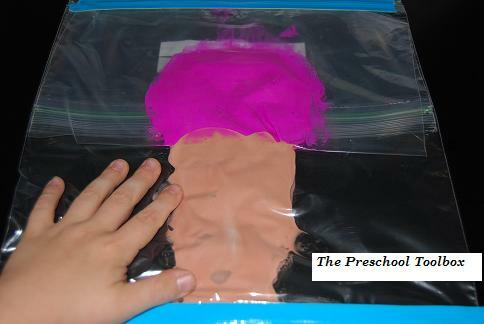 Materials needed: Two gallon size zippered bags for each child, two bowls, two spoons, shaving cream, duct tape, brown tempera paint (for the “cone”), and additional tempera paint colors (for the “scoops”). In one bowl, mix shaving cream and just enough tempera paint to make the shaving cream brown. In the second bowl, mix shaving cream with any color of tempera paint. Take one of the zippered gallon bags and spoon brown tempera paint in the bottom of the bag. Leave that bag open and set aside. In the second bag, spoon the shaving cream mixture for the “scoop” into the bottom of the bag. Carefully fold that bag in half to remove any air, close the bag, and insert into the first zippered bag containing the brown mixture. Close the first bag and seal shut. Tape the bags flat on a table with duct tape. Let the children use their hands to explore the shaving cream/paint mixtures. The “double bag” will keep the shaving cream colors from running together. Can your children make an ice cream cone from the two colors? Make an ice cream cone tray activity with a miniature muffin tin. Place ice cream cones inside the individual muffin tin cups. Set out a bowl of assorted pompoms. Let the children use spoons or ice cream scoops to transfer the pompoms into the ice cream cups. It is a simple activity that allows the children to practice fine motor/transferring skills! Mock Ice Cream Sandwich Snacks for Kids! Ingredients: One container of whipped topping (or make homemade whipped cream), 1/2 package of any flavor pudding, graham crackers, spoons, plates, and assorted cookie decorations. In a large bowl, mix the whipped topping and 1/2 of a package of pudding. Freeze the mixture for 1/2 hour. Give the children two graham crackers and have them spread the “Ice Cream” on one of the crackers with a spoon. The second cracker goes on top. The children can put cookie decorations on a large place and “dip” the sides of their ice cream sandwich, if desired. Serve the grahams with fresh berries for a fun summertime snack! 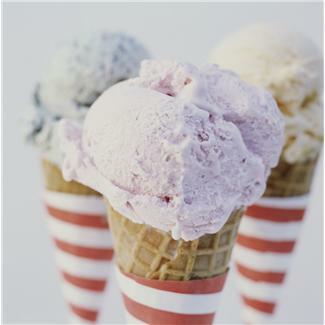 Check back with us this week as we post more Ice Cream Theme activities and ideas! For a complete summertime filled with activities for Preschool and Kindergarten, see The Preschool Toolbox! « June is National Fresh Fruits and Vegetables Month!